The first-ever Ballymaloe Good Living Day proved to be both an interesting and successful day out. It was a day devoted to wellness of mind, body, and spirit. The Ballymaloe Relish 5k Lucky Run celebrated and rewarded the joy of movement – and the rewards were not only for the body. With our winners claiming Cash prizes and Ballymaloe hampers, and it was not just to the fastest runners. The day began at 10am with household advice and a Q&A with Darina Allen, while at noon her daughter-in-law, Rachel Allen, lead an informal discussion on the importance of leading a balanced life. Other talks ranged from music therapy and managing dyslexia to the magic of microbes and universal energy arts. It was a great opportunity to pick the brains of some truly inspiring people. There were also an abundance of stalls for both learning and shopping set up in the Grainstore, while local kitchen heroes served up some delicious, nutritious food throughout the day. Despite the wind & rain we saw over 60 participants kick off the 5K lucky run at 3pm. There was a lot of meeting and greeting being done both before and after the race in the Big Shed. Runners finished in excellent times and there was no man left behind (we even got our photographer to run the last 1k). All runners collected their complementary Ballymaloe mini jar of Relish at the finish line. To finish off an enjoyable day stall holders, runners and members of the public gathered in the warmth of the Grainstore for the Prize giving. Check out our Facebook page here for more pictures of the race. 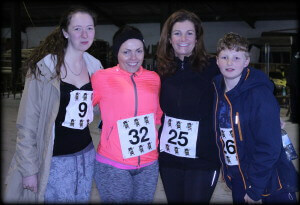 We are already looking forward to next years Ballymaloe Lucky Run and Good Loving Day! Thanks to all who attended. See you next year!